New York Comic Con (NYCC) 2013 has come and gone, but the memories will last forever. At least that's what you might have been led to believe by the unsolicited Facebook and Twitter posts that NYCC made on behalf of unsuspecting guests. I'm not just going to harp on what the convention organizers did wrong, though, because they did a lot of things right as well. 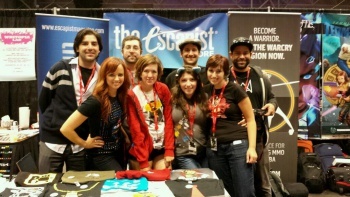 With a convention this large, it's impossible to get everything right, so let's discuss the good and the bad of NYCC 2013. Cosplay, cosplay, cosplay! NYCC is a mecca for nerds of all stripes, and the sheer number of people dressed in costumes this year was absolutely staggering. I would swear that at least one in three people I saw had at least some semblance of a costume on, and many of them had full, elaborate, and masterfully created costumes displaying their passion for and connection to the characters they were portraying. From the uncanny Blade Wolf at the entrance to the wandering Vega, the cosplayers at NYCC are second to none. If you haven't seen them, you need to check out our cosplay galleries: Day One and Day Two. The Bad: "Tap In/Tap Out"
Technology is amazing. I love the convenience of technology. It makes almost everything easier, and my smartphone's GPS is the only way I ever found my way around New York City. (Why yes, I am directionally challenged.) Sometimes, however, people try too hard to use new technology, and it just doesn't work as planned. NYCC 2013 had RFID chips in the badges, so you could scan in and out of the convention. This seems reasonable enough at a glance, as it prevents fraud, keeps people honest, and can even be used to offer them a glimpse into their customers' behavior at the show. The big problem was that the "Tap In/Tap Out" scheme didn't work as advertised. Instead of tapping your badge, you had to hold it for a few seconds against the scanner. In a small venue with a few hundred people, it might not be a big deal, but when you're talking about 2-5 seconds for each scan for upwards of 100,000 people, you're looking at long lines and lengthy waits just to get in the door. Of course, that's best case scenario. During my four days there, my badge failed to authenticate no less than six times. After waiting in line to scan in, when this happened I would spend another 10 or more minutes in yet another line, just to get my badge rejiggered. A couple of hours waiting in line over the course of four days isn't the end of the world, but it was a major inconvenience which could have very easily been avoided. Everybody I spoke to at NYCC this year was an absolute pleasure to interact with. From the staff to the cosplayers to the other exhibitors, everybody was thrilled to be there and eager to make new friends. If you've ever kept up with the Podcat, you can probably tell that I'm not always much of a talker, but I nearly lost my voice from interacting with so many incredible people over the weekend. Fans came by The Escapist booth and we talked about everything from Yahtzee's writing style to our review methodology to our favorite games. One particularly amazing Escapist fan even brought us chocolate chip cookies with Oreos baked in (Thanks, soren7550!) They obviously didn't last long. When you bring this many people together who are all passionate about the same things, conversation is easy. Meeting people, making friends, and forging bonds is easier at NYCC than practically anywhere else, simply because of the shared love of the culture that surrounds it.